I've heard about MUA (MakeUp Academy) before, but my local Superdrug just doesn't stock it. One day last week, I went to a new town and a new Superdrug store - the usual suspects of makeup brands where there, but then I spied MUA and I just had to pick up some items to try. I had high hopes for my little haul. Make-Up Academy Pro-Base Eye primer - £1.50 I picked this up because all eyeshadows just don't last on me - I have the oiliest eyelids so a primer is something I don't own, so this was definitely meant to be purchased! 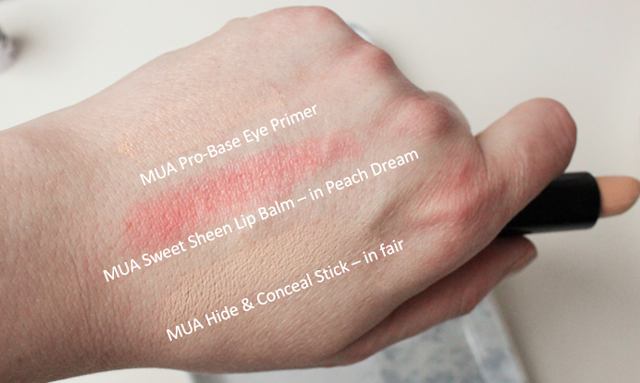 MUA Hide and Conceal Stick - £1.00 I love a good concealer stick for your handbag, so you can touch up spots on the go. Price wise with MUA you cannot go wrong. The packaging is OK, the Sweet Sheen lip balm is gorgeous and I am forever getting complements when I wear it. The concealer stick is highly pigmented and offers great coverage, but the eye lid primer doesn't work - it literally dries then you apply your eyeshadow and within an hour it's creasing, and you can literally wipe it (and your other eye makeup) off of your eye lids. The trio of conceal and lighten products are silicone in formulation, meaning these crease and wipe off easily. I am disappointed with some of the products that I picked up, but I guess I'm used to NARS and Bobbi Brown and MUA are just a budget friendly, starter kit brand for those just getting into make up? The Sweet Sheen lip balms are totally awesome, so if MUA's other lip products are the same great quality, then I will definately trial more from the range. What do you think of MUA? Have you got any favourite makeup items? I think I have tried a setting spray from MUA and I was impressed. I must venture into Superdrug more often. I shop in Boots more often and not and miss out on some great brands.